It wasn’t a government “land grab.” It wasn’t Washington DC waltzing in and taking the land, forcing people from their homes. 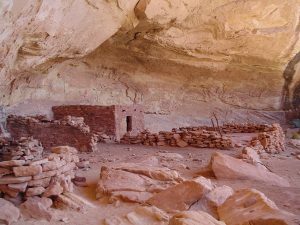 The lands in question, Bears Ears National Monument (Ceder Mesa and the surrounding area) and the Grand Staircase Escalante National Monument were already Federal Land. 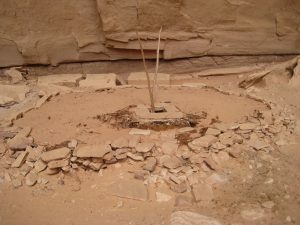 No state land was taken/stolen. 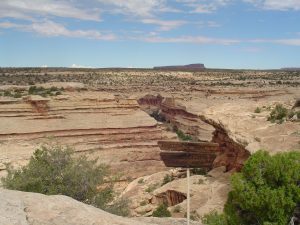 In the case of the GSENM, several SITLA (school trust lands owned by the state) parcels were traded to the Federal Government, by the State of Utah, in exchange for large blocks of valuable, resource-rich land outside the monument boundaries. Again, NOTHING was stolen/taken/absconded with. The establishment of the Monuments was done with the intention to protect and preserve areas possessing unique natural, and cultural qualities. 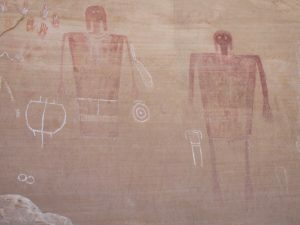 What the monument status did was add layers of protection to sensitive, irreplaceable paleontological, and archaeological sites – fossil beds, dinosaur tracks, rock art, prehistoric burials, villages, ceremonial features and sacred landscapes. 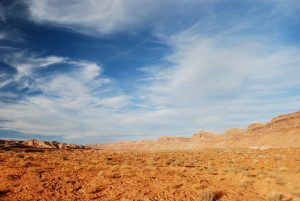 Monument status would help in preserving pristine wildlife habitat, riparian areas, delicate desert vegetation systems and unbroken, spectacular viewscapes – if managed/funded adequately enough to do so. 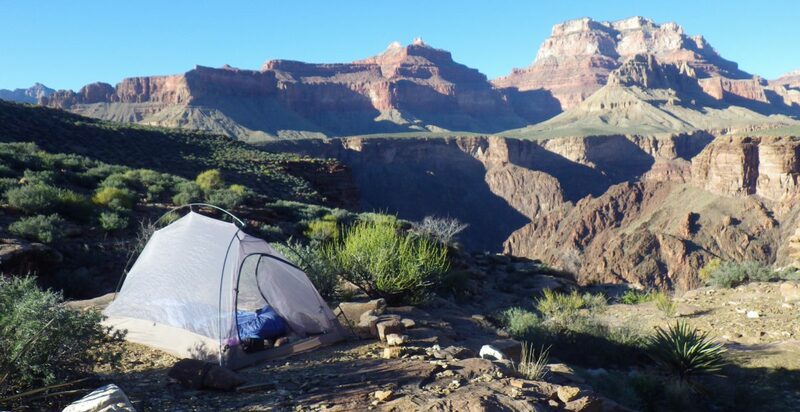 I’ve spent years working and recreating in these places – hiking, camping, climbing, wandering, conducting archaeological survey and site documentation. I spent a season working as a BLM backcountry ranger at Kane Gulch. 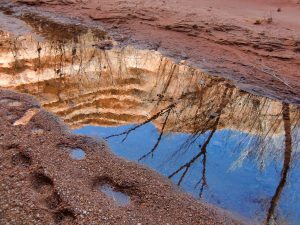 I’ve seen what unrestricted development, unrestricted grazing, mining, drilling, ORV traffic and, yes, even unrestricted recreation (mountain biking, horseback riding, climbing route development, even foot travel) can do to these surprisingly delicate places. They all leave a lasting footprint, some bigger than others. 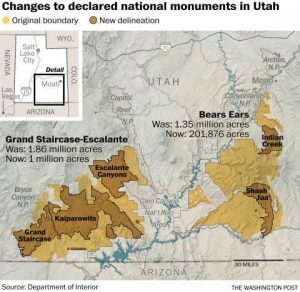 What is potentially at stake with Trump’s recent “downsizing/rescinding” of Bears Ears and Grand Staircase Escalante National Monuments isn’t just the shrinking of Monument boundaries. 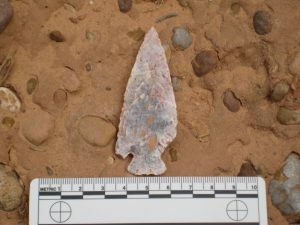 This action could open up archaeologically and paleontologically rich/sensitive areas to surface mining, oil and gas drilling, unrestricted vehicle impacts, real estate development, increased looting/pothunting. 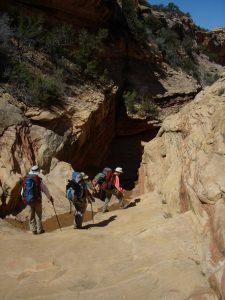 The “new” Bears Ears National Monument would NOT include Dark Canyon, Grand Gulch or Fish & Owl Canyons. Originally they were protected from development by their Primitive Area or Wilderness Study Area status. What their status would be after Trump’s “downsizing” is uncertain. These places were included in the 2016 Monument boundary because of their sacredness to several Native American tribes. They were included for protection because of the irreplaceable archaeological treasures found therein. 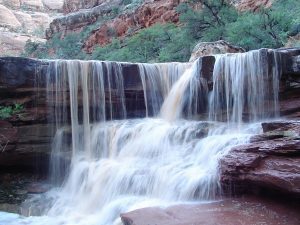 They were included to protect pristine wildlife habitat and riparian areas, ie. their “wilderness quality.” That will all be in question, if Trump has his way. I find hope in the fact that what Trump is trying to do is illegal. 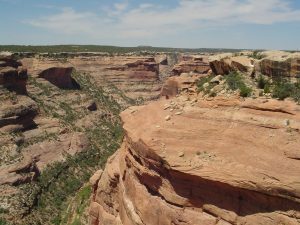 There are several organizations planning to file or have filed lawsuits to stop this, including a coalition of the Navajo Nation, Pueblo of Zuni and the Hopi, Ute Indian and Ute Mountain Ute Tribes, suing on behalf of the Bears Ears, and the Wilderness Society, the Grand Canyon Trust, the Sierra Club, Defenders of Wildlife, Great Old Broads for Wilderness, Center for Biological Diversity, WildEarth Guardians and Western Watersheds Project, the Southern Utah Wilderness Alliance and Natural Resources Defense Council on behalf of the Grand Staircase-Escalante. 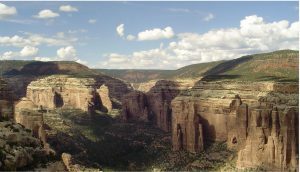 Yvon Chouinard, owner of gear/apparel company Patagonia is planning a lawsuit on behalf of Bears Ears. Right now, I’m in “wait and see” mode. I’m hoping that someone with the power to do so will say that rescinding the Monuments is, indeed, illegal and can’t be done. Or, barring that, the lawsuits will tie the action up for years, until a new, stable administration that truly values our national heritage and Public Lands takes over. “It is also vandalism wantonly to destroy or to permit the destruction of what is beautiful in nature, whether it be a cliff, a forest, or a species of mammal or bird…” Theodore Roosevelt.